The Constitution of 1991 does not define the coat of arms of the Republic of Macedonia, but foresaw the adoption of a law on the coat of arms. This law was not passed until 2009 when the coat of arms of the Republic of Macedonia was determined. Practically Macedonia for 17 years was without coat of arms, although it used the former coat of arms, which was not regulated by the 1991 Constitution. A proposal for removing the red five pointed star first came from MP Faik Abdi in 1992. This proposal was brought several times by the MP Nikola Popovski. 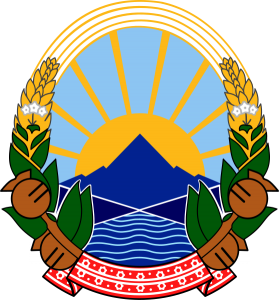 At the end, the then Prime Minister Nikola Gruevski in 2007, proposed the same, and finally, on November 16, 2009, without a public and parliamentary debate, the new Law on the Coat of Arms of the Republic of Macedonia was adopted with an old-new solution to the state’s emblem. In the place of the star, the wheat class was joined. (1) The coat of arms of the Republic of Macedonia is a field surrounded by a wheat class that connects to the top, intertwined with fruits of poppy and tobacco leaves, which are connected to the bottom with a ribbon embroidered with folk motifs. (2) A mountain with river flowing at its foothills is in the middle of the field, and the sun rises behind the mountain. Here the word was just wiped out: “Among the peaks of the class there is a five-pointed star,” and the words “connected to the top” for the wheat class are added. For the first time, the standard of the graphic solution was given, which is “an integral part of this law”. This removal of the five-pointed starwas was announced as an interim solution, which should be opened further and another coat should be defined. The Government proposal of 2014 with lion did not pass.